Your facet joints are found at the back of the spine. These two joints on either side of the spine lock each vertebra together with the vertebrae above and below. Their role is to stabilise the spine by controlling excessive movement especially in extension and rotation. If you have facet joint pain, you are more likely to be over 50 years of age, and you will feel the pain to the sides of your spine. You will have pain when standing still and sitting. It will be painful to move into a standing position from sitting. 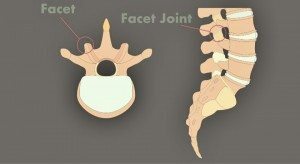 Facet joint pain responds really well to Chiropractic care, so if this sounds like something you may be suffering from, make an appointment today to see your Canberra Chiropractor.